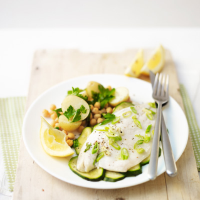 Sea bass is a delicate fish, and steaming it in a parcel with the courgettes helps to retain its lovely flavour and the juices. 1. Preheat the oven to 220°C, gas mark 7. Cook the potatoes in a large pan of boiling water for 12 minutes, add the chickpeas and cook for a further 2-3 minutes, until the potatoes are tender. 2. Meanwhile, divide the courgettes among 4 large squares of foil. Place a sea bass fillet on top of each and scatter over the salad onions. Bring up the edges of the foil and tightly seal. Sit the parcels on a baking sheet and bake for 10-12 minutes, until the fish is cooked through. 3. Drain the potatoes and chick peas and return to the pan. Add the parsley and a splash of olive oil and toss well together. Serve with the fish, courgettes and any cooking juices, and a lemon wedge, for squeezing over. These parcels can be cooked on the barbecue – just sit them on the rack above the coals and cook for 10–12 minutes, as above. This recipe was first published in September 2012.